Whether your Pickleball court is indoors or outdoors, Tennis Court Supply has all you need. 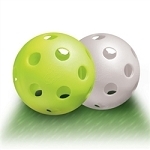 We have plenty of pickleballs from Onix, Dura, and TOP. 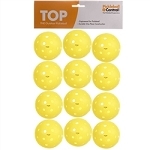 Our pickleballs are available in packs of 6, 12, or 72 and are manufactured to high-quality standards to ensure they are resilient enough for serious play, and durable enough to survive many games. They are all optimized for straight flight and a good bounce. Outdoor pickleballs are a little heavier to help with wind resistance. Choose your pickleballs based on your facility's needs and budget, and feel free to contact Tennis Court Supply with any questions that come to mind.